Even though Link and Zelda never had a relationship in The Legend of Zelda: Ocarina of Time, it is implied that Zelda is the “damsel in distress” saved by her “knight in shining armor,” Link. They don’t kiss, they don’t hold hands and they don’t profess their love for each other. I guess you can thank Nintendo for it’s marketing ploy to make it an “E” for Everyone rating in order to gain more profit. I don’t know about you, but I would have liked to see Link and Zelda get it on at least once! After all, Link almost got crushed to death in Ganon’s castle trying to save the girl! 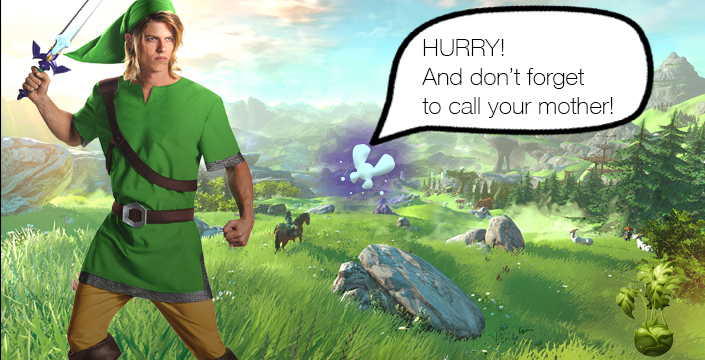 It’s safe to say that Link’s true girlfriend is Navi. Yes, Navi. The little fairy that follows Link around throughout the entire game. She basically is the reason why Link was able to fight off the villains and escape major catastrophes in the game. Navi is with Link from day one and provides him with caring advice, support, and nagging just as a girlfriend would do. Shigeru Miyamoto might disagree with my implication, but that’s okay because I don’t know how to argue in Japanese. Hello gamers! My name is Morgan and I will be offering you satire articles on your favorite video games. I hope you enjoy my articles!